The Play label was founded by Noel Carty of the Noel Carty Promotions agency who managed Brendan Shine. It was based in Dublin. The original Play logo was designed by Peter Yeates of Love Street in 1971. 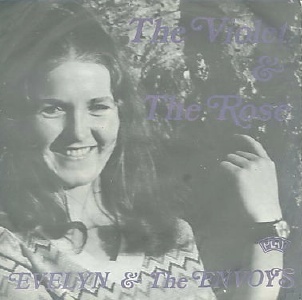 The label folded sometime in the 1990s. Play released a lot of rubbish, frankly, but there are some very good rock singles that are worth seeking out by Tweed, Time Machine and Ned Spoone. There are over 60 Brendan Shine singles. 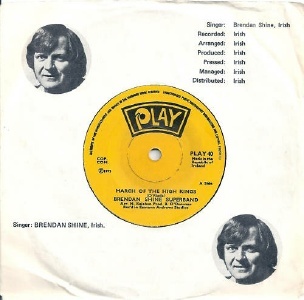 The catalogue goes haywire around PLAY 140, with a string of numbers re-assigned to Brendan Shine singles for some reason. If anyone can explain this, please get in touch. Most of the early Play singles have yellow labels with black logo and text. Some have solid centres, some pushout. A red label variation (with back logo and text) turned up as early as PLAY 11, and was used consistently during 1973-74 (from PLAY 67 - PLAY 75 approx). This was followed by the most common label design, the white label with blue logo and black text. Play was manufactured and disributed by Sparten Records during the mid-80s. Main PLAY Series ran from 1971-1992 approx, from PLAY 1 - PLAY 267. PLAY 145	Brendan Shine - Old Rugged Cross / Rose of Castlerea  [5/1982] also exists as PLAY 155.
with PLAY 173 printed on these stickers, and over the publisher, changing it to "SIMON MUSIC". tracks: I Believe In Marriage/Catch Me If You Can/Do You Want Your ..